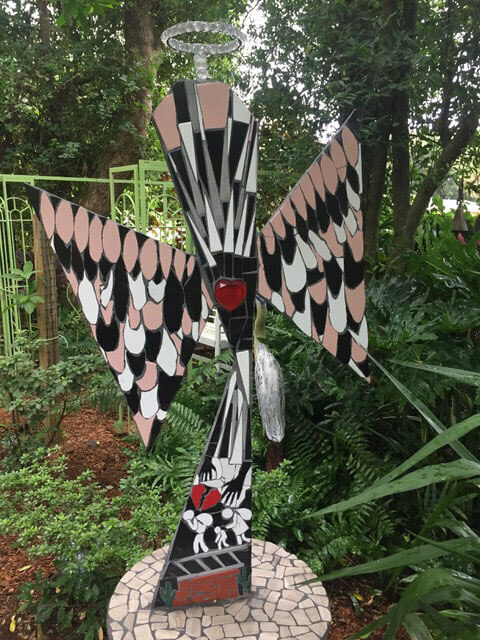 Recently artist Bernie Taylor emailed me some pictures of his mosaic lawn sculptures including some concrete bird baths and benches, and he has an impressive body of work. 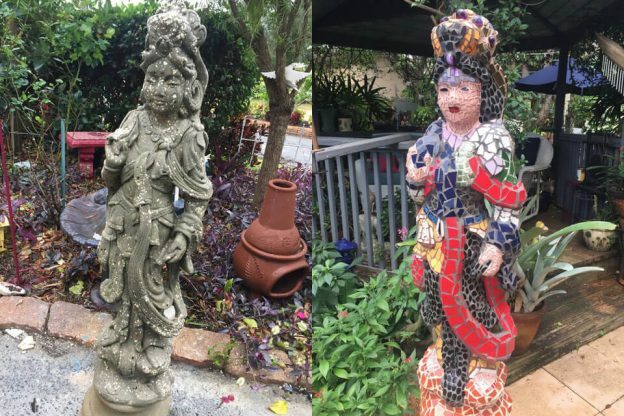 Bernie’s work is also a great example of how you can buy factory-made concrete sculptures and make them unique works of art by covering them with mosaic. 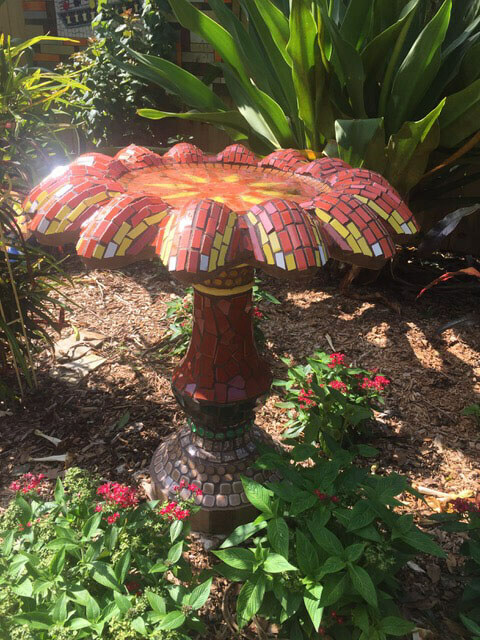 Bernie used glazed ceramic tile for his sculptures in Florida, but keep in mind that ceramic tile is vulnerable to freeze cracking while glass tile isn’t (because it is non-porous). Glass tile is also more affordable, easier to cut, and more widely available in more colors. Glass tile is also smaller and thus easier to fit to curved surfaces. I am very impressed that Bernie was able to tile the complex curves of his sculptures and consistently do such a good job with it. Look at the featured photo above showing Bernie’s statue of the Asian goddess before and after he mosaiced it. Notice how he didn’t follow each curve and shape. Instead, Bernie filled in some of the curves and intricate details with thinset mortar and mosaiced on top of the simplified form. 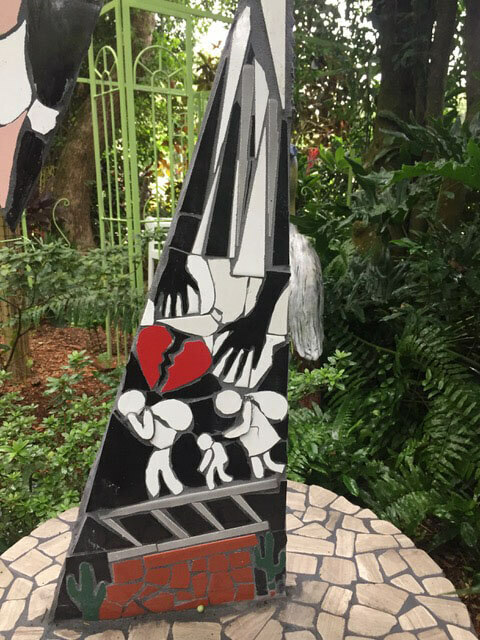 This was a critical decision that made it possible to cover the statue with larger pieces of ceramic tile, but would have been a good decision even if he were using small glass tile. 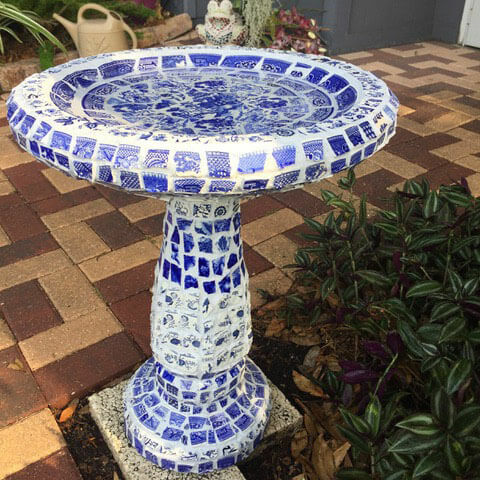 Mosaic Flower Bird Bath by artist Bernie Taylor. If you do want to modify a concrete sculpture before you mosaic on top of it, make sure you do that a day or two at least before you mount the tile. Why? Thinset mortar contracts slightly as it hardens. It wasn’t designed to be put on in thick layers, but you can get around this by adding fillers such as fine pea gravel. TIP: When we need to use thinset mortar to build up a surface or to make shapes, we mix in fine pea gravel to make a type of indestructible concrete. To fill in small indentations in a sculpture, the pea gravel might be too coarse and prevent you from making a smooth surface, and so you have to use judgment about when to use it. Winter is the best time to make mosaic lawn sculptures. Don’t wait until spring weather comes and you want to be outside! Make them in January and February when you have the time and can’t be outside. If you want to build your own concrete shapes instead of buying a factory-made sculpture to use as a base, I have written a page on how to make concrete sculptures, and we also have an article on Jill Gatwood’s method using sticky fiberglass mesh and thinset on top of foam insulation board. These articles show plain flat surfaces being made, but the same materials and methods could be used to make any shape or form, including people and animals. 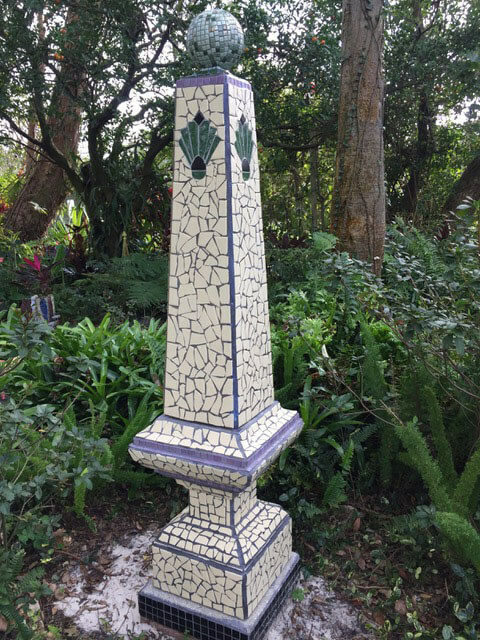 Mosaic Obelisk by artist Bernie Taylor. Bernie’s custom mosaic work looks very good in his garden. 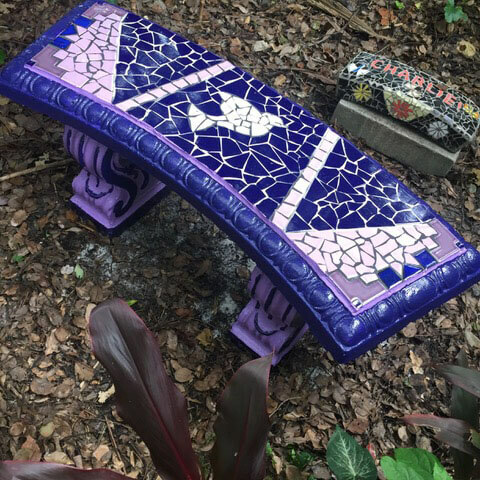 If you want to use factory-made sculptures and benches as a base like Bernie did for much of his work, I have an article on Mosaic Concrete Lawn Sculptures that discusses sealants, perlite, and other concerns you need to be aware of in order to select and use a base. 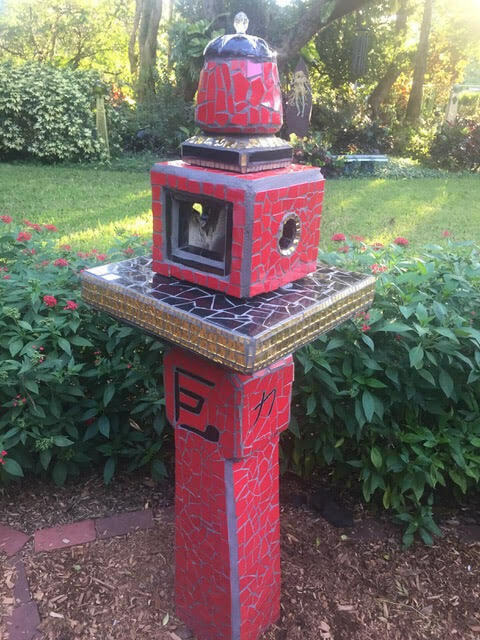 Red Mosaic Sculpture by artist Bernie Taylor is an Asian-inspired piece. 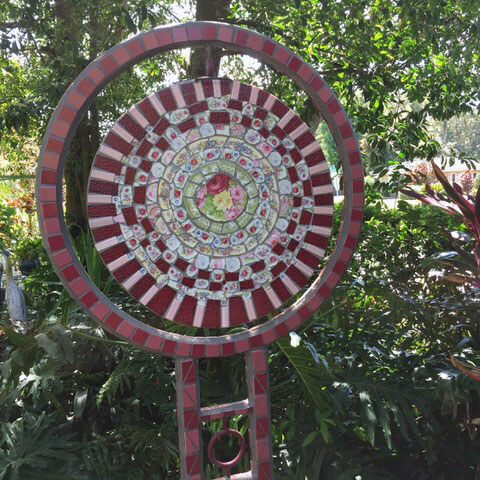 This entry was posted in Art Review, Improving Your Art, Inspiration and tagged garden mosaic, sculptural mosaic on December 3, 2018 by Joe Moorman. 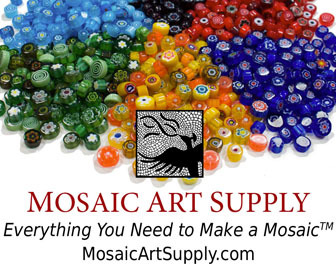 Do you have an article on what adhesives and sealants to use when making outdoor mosaics? I would so appreciate specific guidance as I have never done an outdoor piece. Thank you!!! 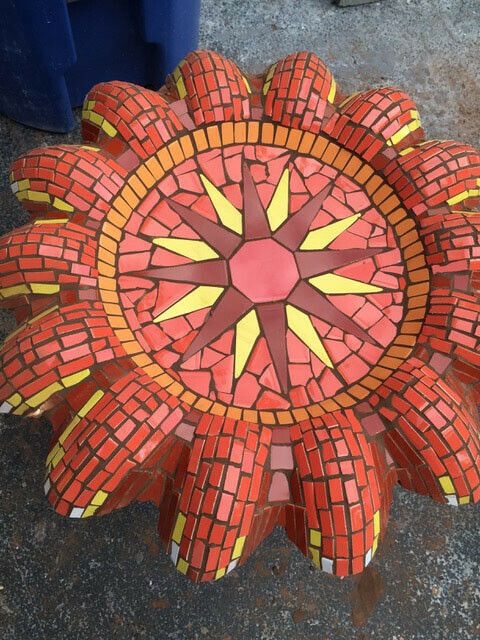 We use thinset mortar for all outdoor mosaics, and here are our instructions for using thinset mortar for detailed mosaic sculpture. If the Thinset is not also used for grout what do you recommend for grouting an outdoor piece? I enjoyed seeing your work. Thank you for sharing. The work here is absolutely amazing. I’m in awe of all these pieces. I especially love the refugee pieces. Great work by a great man. I can’t answer specifically for Bernie, but I grout rounded sculptures with my hands in heavy rubber grouting gloves such as we sell. Of course, you have to make sure that no sharp edges are left on cut edges, which can cut through the glove and your skin. We use Marble Files to smooth the cut edges of tile. I need help. My kitchen backsplash is not coming together. The all important decision of what color of grout to choose is lost on me. How can I pull this mess together? If you’re reading this please contact me. It’s Christmas eve day and I have to make a decision. I need to know what was used tu color the edge of the bench was it die sealer or paint. I am making a garden bench with tile on top but the edge is like a ruffle shape on the sides of the top which can’t be tiled. The blue bench is the one I am referring to. Love the colors. 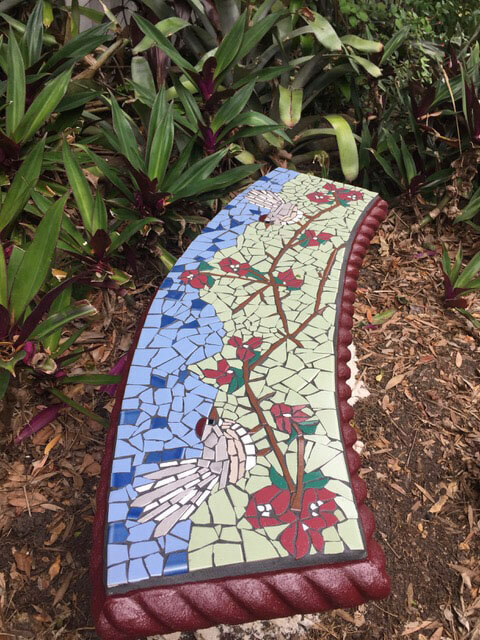 I have seen painted edges on mosaic benches, and they looked fine. You should use a durable outdoor paint, and you should be prepared to repaint at some point years in the future. I would also make sure the concrete wasn’t sealed with anything that might interfere with the paint bonding.